Lex Irwin has been fishing since he was 7 years old. He lives for fishing whether it is fishing socially or competitively. He loves all forms of fishing including estuary, off-shore, beach and impoundments. He’s fished across many areas in Queensland, NSW and Northern Territory. He lives in Wellington Point – a bayside suburb of Brisbane on the doorstep of Moreton Bay and whenever the opportunity presents he will be out on the bay somewhere! He retired from the Queensland Public Service in 2016 where he worked for 42 years. When he retired he was managing a spatial information work group specialising in mapping and aerial photography for the Department of Natural Resources and Mines. 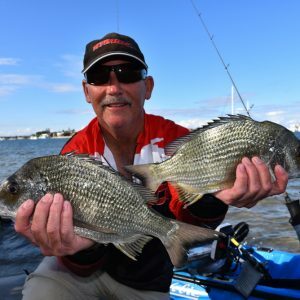 For the past 10 years he has fished ABT bream, barramundi and flathead competitions and many other local bream competitions. He enjoys kayak fishing as well as fishing from his boat.